Built by the Knox yard at Harmar (Marietta), Ohio, in 1877, this slender sternwheeler was constructed on a wooden hull measuring 132 feet in length by 21 feet in width. 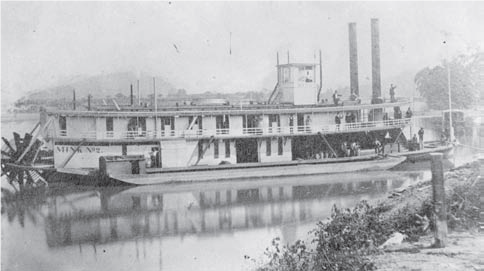 Originally in Muskingum River packet service, the boat ran daily in the Zanesville–McConnelsville trade from 1877 until 1883 under the command of Capt. Carlton Morgan. A year later, with Capt. Diodate Morgan as master, the steamboat continued in the same trade until 1886. Ultimately, the Mink No. 2 was converted into a towboat, pushing barges of salt and coal for the Pomeroy (Ohio) Towboat Company. The riverboat was later sold to Capt. W.L. Cavett of Pittsburgh. On September 30, 1894, the boat collapsed a flue while at Pittsburgh, resulting in the death of one man. Following rebuilding, the vessel was renamed Clara Cavett. The Pittsburgh Plate Glass Company purchased the boat in 1898, operating it as a towboat on the Allegheny River through 1908, with Capt. F.M. Campbell as the longtime master; his son served as deckhand and later earned his pilot’s license. The Mink No. 2 after being rebuilt into the Creighton. Following a rebuilding program, undertaken by the Pittsburgh Plate Glass Company, the towboat was renamed Creighton. The crew was composed of Capt. F.M. Campbell, master; Capt. E.K. Campbell, pilot; Frank Stuart, chief engineer; Lee Camp, mate and Kenneth Campbell, deckhand. Stuart was still on the boat as late as 1926, and had served in the engineroom since 1898. In the autumn of 1928, the Creighton was the first boat to pass through new Lock and Dam No. 6 on the Allegheny River. The owners of the towboat purchased the Wacouta from the Joyce-Watkins Tie Company, of Paducah, Ky., in 1929 and traded them the Creighton as part of the deal. 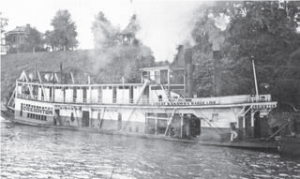 Later acquired by the Arrow Transportation Company, the sternwheeler briefly operated on the Tennessee River until it was sold in May 1929 to Merrill & Sutherland of Charleston, W.Va. With Capt. Eddie Woodward as master, the towboat then operated in the sand trade on the Kanawha River. The Creighton sank at Houston, W.Va., on September 7, 1930, but was raised and rejuvenated. On October 12, 1931, the steamboat led a festive river parade in conjunction with the 37th annual Ohio Valley Improvement Association from Marmet Lock to Charleston, towing the Edward’s Moonlight excursion barge. Shortly afterward, the Creighton was entered into the Kanawha Barge Line. The vessel was attached for debt at Cedar Grove, W.Va., in early 1936, and purchased by the West Virginia Sand & Gravel Company. Eventually dismantled, the hull and cabin became a boathouse for the Charleston Yacht Club at Kanawha City, W.Va. In all, the towboat operated for nearly 60 years under three names. It was my great pleasure to have Ray and Betty Walker, of Paoli, Ind., as recent visitors to the Howard Steamboat Museum. The Walkers have a summer home on the Ohio at Magnet, Ind., greatly enjoy watching the river traffic and are longtime subscribers to The Waterways Journal. The entire Walker family enjoys the WJ, including grandson Rory who, at 4 years of age, especially enjoys having the Old Boat Column read to him. That truly made my day!